1 Bedroom Condo - Ground Floor- Premier Location! Walk to Town & Gondola. Premier location with ski-in access to this cozy condo. Walk to town and the gondola. This 1 bedroom condo is perfect for a couple or 2 escaping the city. The unit sleeps 4, featuring large windows for natural light, and a first floor outdoor seating area, with all the amenities of a large resort. Mountain Thunder Lodge is a highly-sought after rental location. It is a luxury, first-class retreat; situated in a quiet, beautifully wooded community. 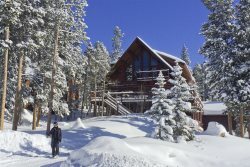 Nestled perfectly among pine and aspen trees, guests visiting will find themselves surprisingly located in the heart of historic downtown Breckenridge; just 2 blocks from Main Street and 1/4 mile from the Breck Connect Gondola offering direct service to Peaks 7 & 8 of the Breckenridge Ski Resort. Not to mention, nearby ski-in access! The open plan dining, kitchen, and living area is a cozy place your family and friends can gather. Open the large windows and relax in front of the fire or lounge on patio and breath in the fresh air. This unit is conveniently located on the ground floor in the sister building to the main lodge. The main pool and one of the property's 5 hot tubs are just steps out of the back door. Heated underground parking is available, though with the free shuttle service and prime distance to town there won't be much of a need for your car! Those interested in everything else Breckenridge offers will be pleased to learn that in under 10 minutes walking, you'll find yourself on historic Main Street with an array of shops, restaurants, galleries, and museums at your disposal. Enjoy unbelievable mountain views of the Ten Mile range from Blue River Plaza, regular events at the Riverwalk Center, as well as direct access to hiking & biking trails, and rental shops to get you outfitted with the perfect gear for your next adventure. If the weather happens to turn or your legs are feeling tired, the Mountain Thunder courtesy shuttle will take you to or from wherever you'd like to go in town. That includes One Ski Hill Place, Breckenridge’s newest development where guests of the Mountain Thunder Lodge can enjoy access to world class amenities such as indoor and outdoor hot tubs with breathtaking mountain views, the only bowling alley in Breckenridge, and two private movie lounges. Very good! Stay Summit left the key for us at the front desk due to late booking. The front desk was a little confused by this, but they finally found they did have the keys. Overall we will use Stay Summit again. Great location & nice property. We did not find the sleeper sofa mattress comfortable for adults. It would be nice to have initial coffee & condiments supplied, but overall nice 1 bedroom unit. The whole process of booking,payment,receiving confirmation, arrival information and keys went seamlessly. The only issue with my ski locker being occupied and that was immediately resolved by Stay Summit and the maintenance crew at Mountain Thunder. Excellent location with easy access to Main Street Breck. Shuttle service came in handy with the heavy snowfall days, providing transport to the lifts, restaurants or shops. Stay Summit's Mountain Thunder lodge was a perfect place for us to stay. It perfectly situated-easy to walk to town, gondola, and City Market. The amenities are fantastic! Can't wait to come back! Fantastic space in perfect location-walking distance to everywhere you need to go! Employees were terrific to work with and answered all my questions promptly. Fantastic staff, super helpful! Mark, Denise and Alex were awesome. We enjoyed the place offering comfortable and quite space super conscientious close to everything. Great staff in stay summit including Mark, Alex and Denise. Stay Summit was very accommodating. We needed a unit on quick notice and they went above and beyond to help us. The unit was exactly what we needed. Mark and his staff were always available to assist with any issues. The unit was clean and well stocked. We will definitely use Stay Summit for future lodging in Breckenridge. Mountain Thunder was a great place to stay. The one bedroom condo was very clean and had enough space for my husband and I. We took full advantage of the shuttle and all the amenities. It is located within easy walking distance to the gondola and downtown Breckenridge. We both would definitely recommend this unit .